e in the safety of your vehicle. If the windshield glass is not installed properly then there’s a high chance of not receiving your vehicles full safety potential. At Auto Glass of Lewisville, we make it a point to do every back glass, windshield, side window, vent glass, or quarter glass properly the first time we perform the auto glass installation. A small crack may appear to be harmless, but it is indeed a hazard to you or the passengers your driving with. The reason why your cracked windshield is more dangerous than it appears is that it helps support the frame of the automobile. Once the automobile’s frame is weakened obviously that increases the chance of being injured in an accident. 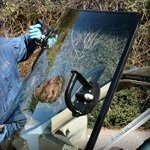 So it’s now easy to see, that makes windshield replacement in Lewisville that much more important for the safety of you and your family. Auto Glass of Lewisville understands the importance of installing your auto glass correctly the first time and will back it up with a lifetime warranty. All our auto glass kits are of the finest quality of materials and follow the installation procedures set by the auto glass industry standards on every windshield replacement or side window installation. When you’re in need of windshield glass replacement or car window installation, Auto Glass of Lewisville stocks all makes and models glass parts. Windshields for some automobile manufacturers are more expensive than others. For instance, your domestic Ford windshield will be less expensive in most cases than a windshield for a BMW. Side window replacement for your vehicle is as challenging as a windshield replacement in some makes and models. Thankfully here at Auto Glass of Lewisville, we have the expertise to knock out any broken glass problem that we encounter. So the next time you’re in need of professions glass installers, choose the pros at Auto Glass of Lewisville.